Allow us to take you on a magical journey! A journey that you will never forget. We are going to introduce you to the best Hogwarts student of all time. And it’s none other than the 10-months old dachshund named Remus. Remus has been skillfully trained to respond to almost all of Harry Potter’s spells! And the credit goes to the owner Anna Brisbin, who is a YouTuber and a Voice Actress from Los Angeles. Anna has been a die-hard Harry Potter fan ever since she was little. “Harry Potter is my EVERYTHING. It’s what inspired me to become an actor, made me a nerd, gave me my creativity and kindness, my friends, everything. I have a tattoo that says “Lumos” in JK Rowling’s handwriting on my arm that I got the day I met her. And of course, my puppy’s name is Remus. So training in Harry Potter spells was really just the obvious choice,” she told Bored Panda. Anna started training Remus when he was only 2-months old. 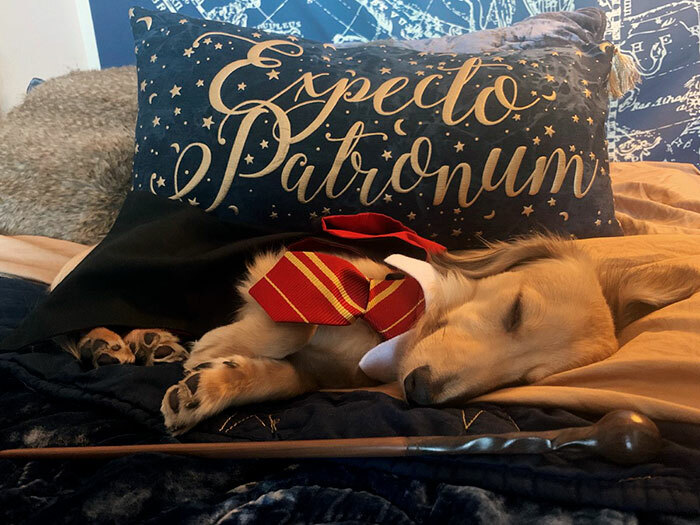 As of now, the 10-month old pup has perfectly mastered nine spells and is undoubtedly the most talented student we have ever seen. The cutest Hogwarts student ever! It looks like everyone is in love with him. What do you think of this good boy? Let us know in the comments below.